When she first went to sea in April of 1961, the U.S. nuclear submarine Thresher was the most advanced submarine at sea, built specifically to hunt and kill Soviet submarines. 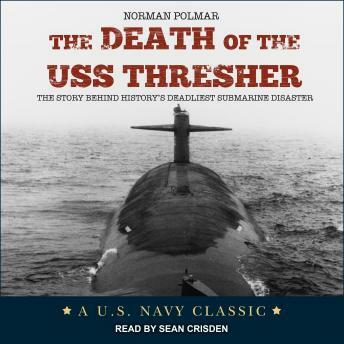 In The Death of the USS Thresher, renowned naval and intelligence consultant Norman Polmar recounts the dramatic circumstances surrounding her implosion, which killed all 129 men on board, in history's first loss of a nuclear submarine. This revised edition of Polmar's 1964 classic is based on interviews with the Thresher's first command officer, other submarine officers, and the designers of the submarine. Polmar provides recently declassified information about the submarine, and relates the loss to subsequent U.S. and Soviet nuclear submarine sinkings, as well as to the escape and rescue systems developed by the Navy in the aftermath of the disaster. The Death of the USS Thresher is a must-listen for the legions of fans who enjoyed the late Peter Maas's New York Times bestseller The Terrible Hours.